Aspen is a handsome sweetheart! He is a spry, happy, sensitive and playful 1 year old. He was found as a stray by a good Samaritan in the San Francisco North Panhandle neighborhood and is just looking for that great home that will offer him attention and love. Aspen loves to play with other dogs of his size, I have not had opportunity to test with smaller dogs or cats. He quickly warms up to people. He has done awesome at tolerating my male Husky who is big into guarding his territory. Aspen has pretty much won him over and they now play constantly. He has been a good citizen in the house. He enters and sleeps very well all night in a crate, once lights are out and place is quiet. He prefers not to be left all alone while crated. But this is not unusual for a dog just getting used to a new environment. He does not seem to know any commands but is patient at pays attention to you, wants to please…he will learn quickly. He enjoys a little bushing and quite attention. Aspen is comfortable in the car and enjoys his rides. I did have him crated for the ride home from the shelter as I also had my other dog, who guards his territory…so I wanted to protect Aspen a bit during the hour ride home. He is a good eater and will attempt to eat my other dog’s food, but my dog guards strongly so no chance. Aspen stands back and has gotten the message. 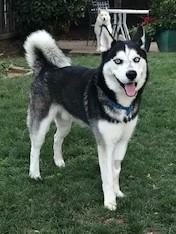 Aspen walked VERY well along with my other two Huskies and does not pull on leash. He is easy to harness and get ready for walk and is curious about everything…but stops his diversion and continues the walk when told to. So some leash training would be good. Aspen would probably do best in a home with another friendly dog. He really wants his pet-mate’s and your attention and love. He is new to us so we are still evaluating him. He is a neutered Male, 17 months old, Housetrained, Lead Trained, good with Large Dogs, has Rabies vaccinations, has DHLPP vaccinations, microchipped.